The Pumgo is the world�s first PEDAL-POWERED SCOOTER. 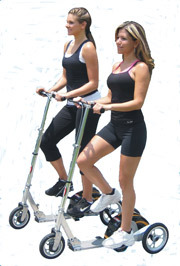 This exciting NEW product combines the excitement of free-riding with the health benefits of a full body cardiovascular workout. 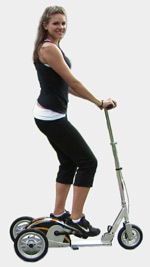 Dr. Dan Batchelor endorses the Pumgo Scooter - great exercise without the back and joint stress! You can go fast, too! Perfect for kids and adults, the Pumgo is powered by two reciprocal pedals similar to the up-down motion of a stationary stair-climber workout machine. The strong aluminum alloy frame easily supports an adult�s full body weight. The three wheeled design is stable and safe with a low center of gravity. More impressive is that the Pumgo Scooter is a JOY TO RIDE. The Pumgo brings the normally boring gym workout to the great outdoors where fresh air and beautiful scenery lift one�s spirits to new levels of fun and enjoyment. Fun meets fitness in a revolutionary new riding experience. The Pumgo Scooter. Once you try it, you�ll be hooked for life...and health! Under the Gearbox Cover is the high-end, revolutionary human-powered engine of the Pumgo Scooter. Anyone can ride within minutes.